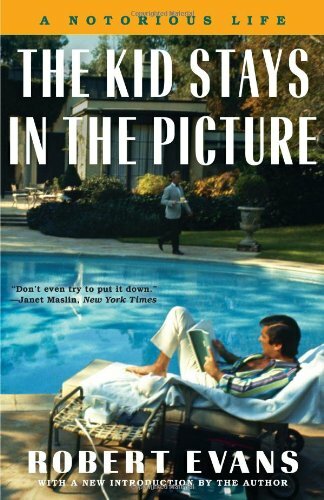 Production is Wrapped on C.I.T.
Around twelve years ago, I read and watched the documentary film for Robert Evans' memoir, "The Kid Stays in the Picture" – The audiobook is also excellent – he reads it himself. I have been thinking a lot about his story over the past several months. Because this work of autobiography is a narrative manual for executive producers. With production wrapped on "C.I.T.", I have completed roughly 2/3 of my job as EP. I was twenty-two when I read the book. I remember being up at two in the morning listening to Evans and in my bedroom in Williamsburg. I triumphed with him when Darryl Zanuck kept him as an actor on "The Sun Also Rises" and suffered when Ali McGraw left him for Steve McQueen. He devoted special care to outlining the thought process that led to his studio's production of classics like Chinatown and The Godfather. Robert Evans talks about an episode when he traveled to option a Vladimir Nabokov manuscript. He was an ardent fan of the author's and loved spending time with him. He was heartbroken when after reading the book twice, even a third time, he was unable to understand it. He had to pass on it, without falling prey to the fear of looking dumb. Producers have to trust their instincts. My wife, Cara Consilvio, is the love of my life and an artist I deeply respect. So many channels of artistic creation flow through her mind. She has an actor's instinct for truth, a dancer's sense of composition and rhythm, and an operatic understanding of emotion. She has a capacity for sustained work and for learning that is rare, especially when combined with her extraordinary sensitivity. The first time Cara told me the true story that served as the basis for C.I.T. I felt that it could be a great short film. I am so happy that I trusted my gut. It's difficult to start a project on faith. All you have is an idea and a belief in a person's ability to execute it. You have to face down discouraging voices in and out of your own head. We were not immune to feeling alone and discouraged. Today, I am thrilled! C.I.T. is "in the can" and I am so proud of our team. Emily Vere Nicoll is a star. Her level of talent, focus and preparation matched her director's in every scene. She is stunningly beautiful and very intelligent. It's an honor that she chose to work on our film. Laura Kiser is truth. Her work cut through my defenses and touched me deeply. She is so alive on camera, compelling and beautiful – amazing. Renée Bang Allen brought such preparation and sensitivity to a challenging role in a pivotal series of scenes. Her warmth, strength and charisma informed her character and made her a joyful presence on set. Kathleen Grace Fiori, already an impressive musical theatre actress is magic on screen. This is her fourth project with Cara and her second with Hup! Such a great presence on-camera and on-set. Our ensemble was amazing each brought their preparation, intelligence and focus to their roles: Jodi Ferguson looks like she belongs at Road's End Farm, her love of horses was infectious; Courtney McGee became her character, often to comic effect; Amy C. James infused her role with intelligence and sensitivity. Our P.A.s/Background Players Lauren Gismondi, Gia Querci and Sonia D'Angio were also wonderful on camera, but more on them later. Director, Cara Consilvio was wonderful as Lizzie's Mom. Greg Emetaz, Cara's Man of Honor and her most frequent collaborator created some of the best work of his career. He was our director of photography and will serve as our film's editor. Light is not a resource that he uses, so much as a language he speaks. I can't wait to review the footage and test my capacity for wonder. Kat Croft, was our AD and Production Manager. We are so grateful to Kat. Throughout pre-production and into production, Kat's love of filmmaking and enthusiasm for the story kept us on track and built the foundation for friendship and future projects. Jesse Kennedy delivered on his promise that we would not be "stuck in the woods with a weird sound guy." Instead, he delivered on making every shot better, through his attention to detail, professionalism and good humor. Anthony Paul-Cavaretta is heroic. His ability to understand, research and execute on designs revealed our characters and made the film better. We threw so many challenges Melissa Roth's way. Early morning shoots, with multiple characters – French braids! I was never in costume/hair & makeup, but the results are inspiring. The already beautiful women in our film are luminous. I would recommend Max Allman to anybody. More than a P.A. or an A.C., Max is a filmmaker. He loves every aspect of film and filmmaking. He's also very smart and hardworking. Sonia D'Angiò was Cara's favorite camper when she was 11-years-old. On set she was our still photographer, all-round horse expert and camp liaison, as well as background performer and stellar P.A. Giovanna (Gia) Querci, drove most of our cast from New York to New Hampshire and back safely. That alone would be enough. In fact, she was wonderful on-camera, an energetic production assistant and an extraordinary asset on set. Lauren Gismondi stepped in and stepped up. She and Kathleen Grace Fiori, read with our cast for their auditions and when another P.A. dropped out the day before our shoot, Lauren joined our team. She was great on-camera, she was our prop master and my right hand – I will never forget what she did for us. Road's End Farm invited us with open arms and added greatness to our film production. Tom, Alicia, Margaret, Lesley – Carmen! They were our location, catering, horse trainers, aerial lift operators and storytellers. They opened their home to us, right after their busy camp session had ended, out of love for Cara. Everybody on set fell in love with the place, their philosophy and the food. Carmen is a treasure, the catering with produce from Alicia's garden was extraordinary. They were accommodating under difficult circumstances. One of their great horses, Claire, had to be put down during the shoot. Their support, hard work and dignity are inspiring and appreciated. Cara Consilvio is a film director. Sometimes it takes a while to do what you were always meant to do. Cara was born to be a director. She wrote a beautiful script, a coming-of-age tale about friendship and loss. She made a detailed plan for the shoot with an understanding of light, her actors and the rhythms of farm life. She created a space and support that inspired breathtaking performances from wonderful actors. She framed indelible moments. Cara is a director. Seeing her in her flow, fully using her mind and her talent is worth any sacrifice. I spoke to our cast and crew on Sunday night. I expressed that we had designed a situation that would allow each of them to do their best work. It was a hopeful plea, early in the process, hoping to connect how I felt with their aesthetic drive. With production wrapped, I believe we have succeeded beyond my hopes and expectations. Thank you, Evans! I'm glad I trusted my instincts.